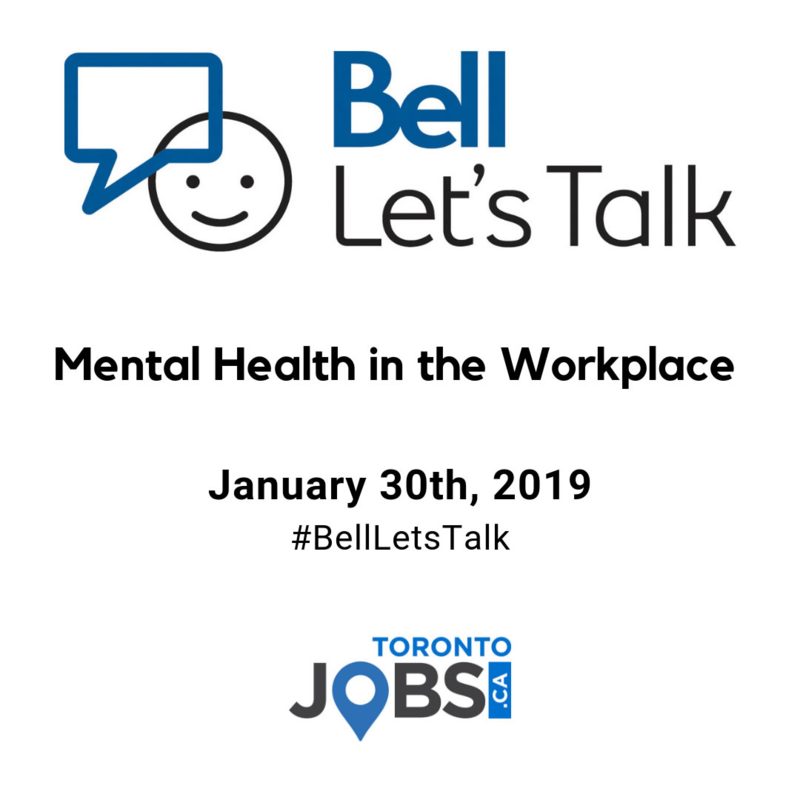 As our TorontoJobs.ca team gets back into the swing of things for 2019, we’re making a pledge to focus on mental health in the workplace. Just like in every other aspect of life, mental health contributes as greatly to one’s overall health and wellbeing as physical health. For Bell Let’s Talk Day on January 30th, we’re asking you to join us in speaking up about your mental health and continuing the national conversation. By acknowledging and discussing mental health, you are helping to end the stigma. Taking an hour or a day (or two) away from your workplace can not only boost your mood and help you feel refreshed but can actually lead to more motivation and productivity within the workplace. Being in “poor mental health” is not always clear and obvious. One might think, “I’m not feeling great, but it’s not like I’m depressed or anything.” Too many of us brush off the mental and physical cues that our bodies provide just because the symptoms aren’t extreme. Paying attention to your behaviour, desires and needs at work, no matter how subtle, can be key in helping you determine when it’s time to step away and take a mental health break. Remember – you’re human! 1. You wake up feeling physically drained or even nauseous – and the day hasn’t even begun. Your body showing ongoing signs of physical ailment can be a direct result of mental strain. Take a break before you burn out – not after. TIP: Carve out a time each day for fresh air and a brief walk. Even if it’s only a few minutes of strolling around the boundary of the parking lot, you’ll find that fresh air and physical activity can help ease headaches, clear sinuses and leave you feeling energized. 2. You’re feeling a lack of motivation to work and/or connect with coworkers. If you feel like your mind is somewhere else, that’s probably because it is. A lack of motivation can often be resolved by simply taking some time away to regroup and give your mind a rest. TIP: Plan a lunch out with at least one of your coworkers and commit to discussing anything EXCEPT work. Taking the opportunity to bond with your team outside of your place of employment can help develop stronger team bonds and support within the workplace, too. 3. Your productivity has plummeted. Are you having trouble focusing and completing tasks? Have you started making careless mistakes? You might need some time to recharge. TIP: Take five minutes daily for some simple yoga exercises that you can literally do from your desk chair. The break is short but meaningful – it’ll be just enough to clear your mind and help you refocus. 4. You’re disconnected from your personal life. If work is taking so much out of you that there’s no time left for friends, family and personal hobbies and commitments, you need a break. Don’t underestimate the importance of work-life balance. TIP: Make an effort to leave work on time. You might regularly tell yourself, “Another ten minutes and THEN I’ll go…” or, “I just need to cross one more thing off my list…” Blurring the lines between work time and personal time takes a huge toll on your mental wellbeing. In order to have proper work-life balance, the boundaries need to be clear. 5. The look of your workspace has changed. Are you typically organized and tidy but your desk has become a cluttered mess? Do you usually work well with a bit of clutter but suddenly you’re showing signs of OCD? Either way, major changes to your workspace and work habits often reflect the state of disarray in your mind. TIP: Finish each workday by writing out a list of tasks/goals for the next day. Decluttering your mind before going home can help alleviate the stress of having everything swirling around in your head. 6. You feel resentful toward anything work related. If you’re feeling irritated by your coworkers or easily frustrated and fed up with tasks, your body might be telling you to take some time apart from your workplace. TIP: Recognize the parts of your day that bring you happiness and make an effort to really enjoy them. That might mean making a new playlist of feel-good songs or downloading a podcast about your favourite guilty pleasure TV show to listen to on your commute. It might mean packing yourself a delicious lunch the night before that you look forward to all morning at work. For some, it simply means checking in with a loved one over the phone for a few minutes. Try to appreciate and focus on those bright spots in your day rather than rush through them. Don’t be afraid to talk about it. If you’ve taken time to focus on your mental health and still find yourself feeling unmotivated, unhappy or emotionally and physically depleted after your workday, it’s time to open up with your employer. Most companies have the best interests of their employees at heart – and supporting mental health is important for everyone long-term. Looking for professional help? Contact the Canadian Mental Health Association for support and resources or reach out to a Crisis Centre in your region for more immediate assistance. At TorontoJobs.ca, we’re making positive mental health and wellbeing an ongoing discussion in the workplace – join us in ending the stigma. Written by Lindsay Ireland, Marketing & Events Manager, TorontoJobs.ca. TorontoJobs.ca is a full-service recruitment organization, including TorontoJobs.ca Website, Career Fairs, full-service Recruitment Division and Outplacement Services. The local focus and advanced features make TorontoJobs.ca a vital asset for both job seekers and employers within the Greater Toronto Area. Visit our Online Career Centre for additional articles on Career Development, Personal Branding and more! For more job and workplace related content from TorontoJobs.ca, pleae click HERE.